Sheer Blonde you say? John did it his way! I will say getting highlights, the price you pay you like to make them last. When I had seen Sheer Blonde Shampoo on sale, I figured I would give it a try. To me the highlights seem to have lasted longer, kept them brighter......I say that is a win, win! Effectiveness John Frieda helped me keep my highlights longer! Scent The scent of Sheer Blonde, by John Frieda I can not complain. It isn't overpowering or have you wondering "What did I just put on my hair?" This isn't a floral scent, just a scent without the fluff. I had a good experience while using this shampoo. I am a natural blonde and have stayed a blonde all of my life. I love to bring out the blonde highlights in my hair. I purchased this shampoo to try and enhance my color and really show off the blonde. I thought it did a good job at making my color look really vibrant. It did not enhance it a large amount, but it was enough to make me satisfied. It also got my hair really clean and left it feeling great. It was super soft while I was using this. It is definitely worth the price. I would highly recommend this for blondes looking to bring out their color. Effectiveness I found it to be an effective shampoo. It definitely got my hair clean and made it look really nice. It also worked to enhance my color and make the blonde in my hair stand out. Scent The scent is great. I think this shampoo smells really nice. I paired it with the conditioner to really bring out the scent in it. I tried this shampoo, a few years ago, and I love it! It is a little more expensive than the shampoo I was used to buying, so I don't buy it all the time, but I like to use it sometimes. I think it really does lighten up my hair. 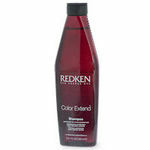 (So I really like to use it in the winter, when the sun doesn't bleach my hair naturally) This shampoo is great for that! It leaves my hair lighter, and it really made them soft and manageable! I used this shampoo, with the conditioner as well. I wouldn't recommend using it with out conditioner as well, unless your hair are very different than mine! This shampoo has a good smell, and it leaves you feeling very clean, and beautiful! :) I would recommend this to any blonde! 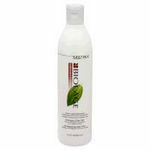 Effectiveness I love this shampoo! It is my favorite! Perfect for my medium blonde hair! Scent I think this shampoo, smells great, I'm not sure how to describe the smell, but it smells good :) One of my favorite shampoos for sure! 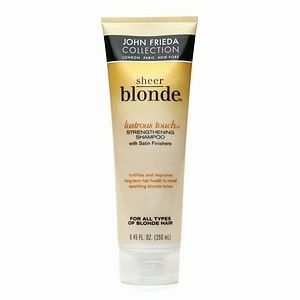 John Frieda Sheer Blonde Shampoo - works well, but has an unpleasant scent. I used this shampoo for a short time when I had blonde highlights. My hair colorist recommended it once when my blonde highlights looked to platinum and brassy. She told me that using this shampoo and matching conditioner would warm up the blonde. I used it for about a month and half and it did work. (Or maybe the blonde highlights would have warmed up by themselves.) But for what it's worth, it worked for me. The down side of this product (and the conditioner that goes with it) is the scent. I just do not care for it. I can't really describe it. Maybe something like medicine? Whatever it is, it is not a scent that I cared for. I was glad when my color got to the color I wanted and I went back to my "regular" shampoo. Effectiveness I rate effectiveness with a 9 because it actually did what I wanted it to do. It has adequately rich lather and it rinses clean and clear. It left my hair clean but not especially soft or full. Scent I know scent is a personal preference. And this scent was definitely not my taste. Yuck! In the past I had color treated hair that was hi-lited blonde, so I always made sure to use John Frieda Sheer Blonde Shampoo. The shampoo really made my blond color stand out, while keeping my hair clean and healthy. The shampoo was gentle enough to use on my color treated hair. It did not strip the color at all. Rather it did the opposite, and really helped my hair stay a lighter shade. The shampoo did not make my hair oily at all, and it even helped keep it moisturized. This is really important to me because my hair is very long and frizzy, so I always try to find a shampoo that will help prevent flyaways by keeing my hair moisturized. Effectiveness This shampoo really helped keep my light color vibrant. After I started using this shampoo, my friends actually asked me if I had my hair colored again. Scent This product smelled good and not at all like chemicals. It was not an overwhelming scent, so it didn't really stand out as smelling amazing. By the time I was 12 I was already highlighting my hair. My grandmother owned a day spa and during the summer I would always spend at least a day or two wandering around the spa helping with things or being a guinea pig for new products. I was a lucky kid! Point being, even though I have color treated hair this shampoo still brought out subtle highlights in my already blonde hair. After just a few shampoos I noticed the difference. It is a slow and subtle build up so, don't worry its not like you are pouring bleach on your head. It mimics what would happen naturally if your hair got a lot of sun. Since it does build up over time it makes the whole effect seem very natural vs. over powering. I always let it set for a few minutes once I had lathered it in my hair, I like to think that letting it set gave it time to really work. Im sure it didn't hurt anything. I've used this product over the summer when Id rather be outside than sitting in a salon chair. It never fails to amaze me how many people compliment my hair when I use this shampoo, they all want to know who my colorist is. And while I love my colorist, this is much cheeper and since it builds up over time I have complete control of how blonde I want to go. Effectiveness Really does bring out the blonde. Its still gentle enough to use when shampooing regularly- you really get your monies worth. Scent Its a soft unoffending scent. Pleasant enough but not anything ground shaking. Sheer Blonde is the perfect shampoo for natural, highlighted or or dyed blonde hair. I'm dark blonde naturally, but have used this product for years, on my natural colored , light blonde, dyed and highlighted hair . 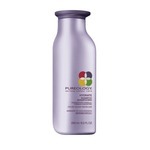 My hair is very thin and tends to be dry, but this shampoo keeps my natural and colored hair shiny and soft. It adds a kaleidoscopic sparkle to the different tones of blonde, light and dark. After switching to other shampoos that were more expensive over the years, usually bought after being pressured at a salon, I always come back to this one. I also have tried other, store bought shampoos, which either weigh my hair down or dry it out. Sheer Blonde is a sure thing if you want healthy, shiny blonde hair. Effectiveness This is the best daily shampoo I have ever used and it removes all traces of hair product with having to repeat the washing, as most shampoos recommend. Scent There is a slight herbal smell, that isn't too strong or overpowering. I had naturally strawberry blonde hair growing up and as a kid. I found that the more time I spent in the sun the lighter my hair would get but it was hard to keep those beautiful highlights in the winter time when I spent more time indoors. Now I can have beautiful highlights all year long. Effectiveness This product is definitely one that delivers. Does exactly what it says that it should do. I was really impressed with the results. The product is a little expensive but that is the way it goes when you are paying for the name. worth every penny. Scent The shampoo smells just like hair dye. It has ingredients in it to lighten the hair so that is understandable. My hair only smells like it while I have it on. I never have to worry about it when I get out of the shower or after my hair dries. Makes my hair super soft and shiny while giving me that beautiful blonde that I love in the summer time all year long. I have always been into finding a product that will work well on my hair and cost less. This is exactly that. I regularly get my roots done at the salon and am always looking to make sure that I have a product to use that will not only make my hair look shinier, but also that will make it overall healthier. This product has improved my hair tremendously and is affordable to most. Use only if your blonde. As i said above use this shampoo only if you are blonde. That is why it is called the John Frieda sheer blonde shampoo, it is meant to be used on blonde hair and only blonde hair. It is semi-effective if you do have blonde hair. It is used to highlight and or brighten and or lighten your blonde locks from the blonde color that they already are. This shampoo takes time to use before you see any change, which is a bummer for those who are like me and have no patience what so ever. The pluses to using this though is that it is not a dye so you technically are not dying your hair, which means there should be no reason that your hair should split, break, get fly away pieces, or come out orange or any other miscellaneous color that can occur when dying hair, especially when dying it blonde. The scent is okay, it could be made to smell better, where you would actually want to smell it and you would actually want to put it in your hair for the smell.